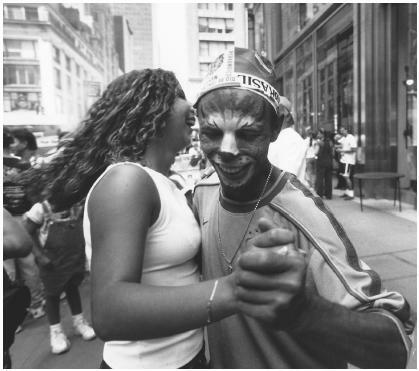 Michelle Jesus and Adenilson Daros enjoy dancing together at the 1998 New York Brazil Street Festival. Brazil, it is primarily a country of Portuguese origin, and its official language is Portuguese. There is little published information on Brazilian Americans as an ethnic group, even though Brazilian immigration to New York City is rapidly rising and has been since the mid-1980s. This Brazilian American dancer is wearing a Carnaval costume. American life that it is not uncommon to see hundreds of people gathered around a single small television set watching a game. Common greetings and expressions in Brazilian Portuguese include: Bom dia —Good morning; Boa tarde —Good afternoon; Boa noite —Good night; Como vai? —How are you? ; Obrigado —Thank you (masculine); Obrigada —Thank you (feminine); De nada —You're welcome; Pois não —Certainly; or, Don't mention it; Passe bem —Goodbye; Até amanhã —See you tomorrow; Que horas são? —What time is it? ; Como se chama a senhora ( a senhorita )?— What's your name? I just have to congratulate you for such an interesting project. It's out of this world. I would like to know if it's easy - and of your interest - to have all the text read and recorded by native speakers of English so that this could used as a rich source of teaching material. For example, the overview and all the rest could be turned available in mp3 format. Besides having the written material, the same stuff in sound format would give the learners of American English another pretty good source of info. Awsome article. My girlfriend, future wife, is from Brazil. This article has really helped me to understand a little bit more about her general background. Trying to get information such as what this article provides is little difficult. I am from California, a native, and my out look is very different from many other people. Now I understand a little better our differences. Now if I could only get her to read it. Loved it! Extremely educational! The best Brazilian web-site I have came across yet. Really great work. Congratulations. I'm from Brasil and it is good to know that a little bit of my culture is being spread around the world. Of Course Brasil has too much more to offer for its visitors, but your project is really helping many peopple to understand a liitle of us. Congratulations once again, and don't forget to visit our beautifull and awesome country guys. I'm delited to find this text about Brazilian Americans. So informative. Well done! Without generalizations the author was able to convey a fairly true picture of Brazilians in the US and our ties to Brazil. Congratulations! This is a great website based on true facts! I really recomend it to anyone interested in the subject! Thank you, great piece on Brazilians in N. America. For a short article it is comprehensive and Margolis' book is outstanding. I stumbled upon this website upon doing some searching on Brazilian immigrants in the United States. I was born in Rio de Janeiro and moved to the US with my family when I was very young... I haven't been back to Brazil since, so I feel distanced from Brazilian culture, which I treasure very much. This article was very informative and made me nostalgic! Very good article, however, one should update on the current Brazilian leader, president Luis Inacio "Lula" da Silva? He has done marvelous things for Brazil during his presidential terms. He should be recognized. Brazilians are really good at cooking red meat. Why is it that Red meat seems to be a speciality? What is the most popular dishes in brazil that has red meat in it? As a Brazilian American, I really appreciated finding this article about Brazil's culture, History and Immigration to America. Very well written and clarifies many misconceptions the general population in USA and in the world have about Brazilians and it's culture and History. I really enjoyed and I will share with family and friends. Thank you e muito obrigada! I am a school librarian and like your site. I teach students about website credibility, could you please email who/or what organization is responsible for creating this website. I am a Brazilian American w/27 years living in the United States and I enjoy the article very much specially the part that talks about the common stereotypes that Americans and other cultures make about Brazilians because they didn't know the culture well. I love the section about religion because very few people know that is a religion in Brazil that follows the teachings of Allan Kardec a French philosopher. My grandmother follows Spiritism and also my sister in low and many of my friends back home. I enjoy the article because went into details and explain everything very well what demonstrate the command of the Brazilian Culture in general. Obrigada!